As it should be . . . 5/7/13 Update. After a scorching week of bright sun and record-breaking high temperatures here- Seattle was the hottest city in America yesterday! Up here on the Olympic Peninsula, just an hour from Seattle, we enjoy more moderate temperatures. Now we are back to a seasonably "normal' springtime weather cycle- with cool cloudy skies and daytime temperatures in the 60's. This is really perfect trout fishing weather; On the beaches, On the lakes, On the rivers. Personally, I like it like this. For much of the last week I have hidden inside, cowering from the stifling heat, eyeing the knee high weedy yard apprehensively, tying flies and waiting for the heat wave from hell to subside. Now it's time to get out there, and fire up the weed whacker, clear cut the towering grasses, and hit an late afternoon high tide. No doubt the heat wave, and bright light, really stirred things up in some of the lakes and rivers here in western Washington, and judging by all of the aquatic flies I am seeing, smeared all over my windshield, the fishing should be pretty good. Ants are in abundance now, and winged ants as well. 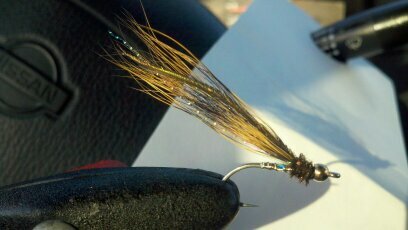 So I will make sure to have a few in my fly box- yes, even in saltwater- Trout love ants! We have had so much nice, almost-summer weather here lately, that one could easily forget that we are only entering May, and we still have June-U-Ary to get through! Don't laugh- we got sunburned on the beach one June day, and when I got home that afternoon there was hail in the roof gutters of the cabin. Beach fishing for sea run Cutthroat has begun here, with lots of sun, and a little wind, and a few nice fish to hand last week. I have always liked May the best, as far as the timing for returning to the beaches here. By May just about all of the Cutthroat that have spawned locally have been out on the saltchuck, for a few weeks to a month or more, feeding heavily on Chum fry and juvenile forage fish, and gaining weight. By May these fish are robust and full of fight again. And it only gets better as they feed their way through spring into summer. Many of these trout are caught at the tides edges, in very shallow water, as the forage species- especially salmon fry- are taking advantage of softer currents, back eddies, and seeking tide pools along their seaward migrations. As juveniles they struggle in some of our strong tidal currents. They work hard to stay in the softer flowing edges of things. Right now I am seeing very tiny Herring in the shallows, and the Chum fry are as small as 1-1/2 inches and as big as two and a half to three inches. This reflects the fact that some of them have been in the salt water longer than others, and that the general trend is toward working their way seaward, from south to north, throughout their juvenile lives. So your fly box should have some very sparse and tiny fry patterns, ( I tie some of mine on size 12 dry fly hooks ), and some medium sized ones, and a few big ones too. This sea run Cutthroat took a fly within ten feet of the beach, in two feet of slow moving water. My Little Stone's Chum Baby has been productive so far, as have some of the other flies we use, like my Beach Baby,( a good sand lance, herring and smelt imitation- size # 10 through # 6 ), and the Rolled Muddler, and Deer Hair Muddler, Knudsen's Spiders, Sculpin, Matukas etc. I always have a few of Leland Miyawaki's Beach Poppers with me too. I was tying some Chum Baby flies down at the beach the other day, in the truck, and it was really windy- enough so to bring out the surfers. Just as they hit the water our local radio station played Brian Wilson's great old classic Beach Boys hit song: "Surfing U.S.A". Enjoy! If you want to tie your own Chum Baby flies: Send $5.00 and a self addressed stamped envelope to me, and I will promptly send you back two sample flies, one small and one larger, and a two page instruction sheet to work from. Just don't let your wife catch you tying these things in her Porsche! The forecast ahead is calling for mild and sunny, warm weather here through the week. We could be enjoying summer conditions again! Last weekend we got hit with some strong winds, big new moon tides, and a pressure front change, and all of that really stirred up the waters through Monday. And the cold air that moved in was refreshing indeed. So, if anything, it has moved the fish and the forage around, and the trout will likely be taking advantage of these milder, much less windy conditions, to hit the shallows again. Around the full moon we had some big tidal exchanges, with very strong current flows, and that too will be calming down by mid week ahead. I like the softer tides around here, just before and after the new moon and the full moon, as this tends to allow the forage fish to hang around more, with less current to carry them away. If they go- the trout go with them. If it gets sunny and bright, which is exactly what we expect, then be prepared for sun exposure. The Olympic Peninsula is one of the few places I have ever fished where you can get hypothermia from the waist down, and sunburned from the waist up, all on the same trip. A pretty spring sea run to hand! If you want to come fly fishing on the Olympic Peninsula waters- Give me a call or an email, and we can work out the details from there. We need to plan it ahead. The beach fishing has just begun, and each month will bring new and different opportunities for saltwater fly anglers. Our summer steelhead fishing on the rivers should be good through June and well into July. We have a substantial snow pack this year, and that will provide cooling flows for the fish to thrive in all mid-summer long. Trout fishing will open in June on most of our waters, but the earlier Game Fish Season opens on the Sold Duc on May 1st. That can be a nice little interval of early trout and summer steelhead fishing in very good and fresh river flows. For a real fly fishing Odyssey: we can fish for Cutthroat in the rivers, and on the beaches, all in one day! Bright fish on a bright day! 18 inch wild sea run! On a Chum Baby! Remember; Fair Chase fly fishing only, Catch & Release, One single barbless hook fly, No bobbers, No floats, No indicators. Fly Casting Instruction- Single-Handed and Two- Handed rods. I offer private and group instruction for fly casters of any experience or ability, from beginner to expert. Learn the basic mechanics of fly casting and begin the adventure of a lifetime, or tune up your distance and accuracy casting for your next big trip. I have been teaching fly casting for over 15 years. I have been a Certified Casting Instructor, by the Wulff School of Fly Fishing, in the Joan Wulff Method, by Joan Wulff, since 1999. In the spring of 2000 I was certified under the Federation of Fly Fishers Certified Casting Instructors program, by then Casting Board Of Governors Chair, Dr. Floyd N. Franke. The lesson sessions, of two hours duration, are offered in the Port Townsend area, usually for one or two students. Lesson arrangements are made by prior agreement. Celebrating over 33 years of singularly distinguished fly fishing adventure!